Paul George knocked down the game-winning three-point shot and drew enough contact for a foul as he crashed to the ground and beat the Philadelphia 76ers, 117-115, in a heated Saturday evening shootout. It’s just the latest masterpiece finish for George, who’s having an All-NBA season. This might be the best basketball he’s ever played. The four-point play had George finish with 14 points in the final quarter. He stole the spotlight from Jimmy Butler’s would-be game-winner. Butler jumped out and stole an ill-advised Dennis Schroeder pass for a layup with seven seconds to go, and looked like that would seal the game. George finished with 31 points on 8-of-20 shooting, with six rebounds, five assists and three steals. He’s revised some fans’ views of who the Oklahoma City Thunder’s best player, taking the throne from Russell Westbrook. 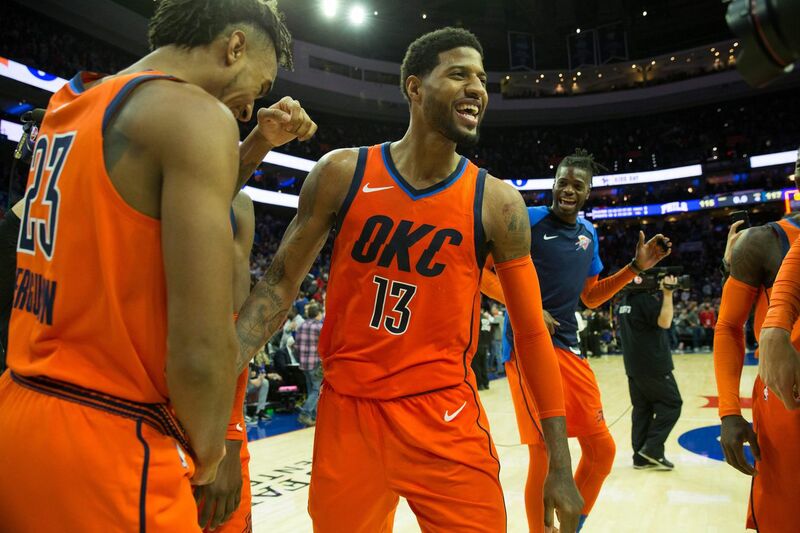 Westbrook fouled out in the final minute of the game after fouling Joel Embiid on a three-point attempt, making George the team’s go-to option on the final possession. It paid off, and proved OKC might be better off with the ball in his hands late in the game. The Thunder are finally starting to put their pieces together. It appears George made the right decision coming back to OKC.